Rarely do I read a trilogy and find myself at the end loving the third and final book most out of all of them. Generally, it's usually the first book that always tends to be my favorite. But although I loved Shiver, I have to say Forever was just fabulous and I think I loved it the most. Grace, has turned into a wolf. Sam is human and thought to be cured and waiting for summer and the return of Grace. Cole has taken on more of a main character role at times and has been going through some thinking and life changing. We watched Cole grow quite a bit in Linger, but in Forever he's still his handsome cocky self, but a much more mature (at times) version. I even found myself loving his character as much as I love Grace and Sam. Forever, is a race against time. First when spring begins to sprout in Minnesota, some of the younger wolfs begin changing early. But the local town is still in a rage, and when a body of a dead girl turns up and it is obvious she had been killed and attacked by wolves, this sets plans in motion to get rid of the wolves forever. The wolves aren't the only ones in danger. All eyes are on Sam since he seems to be the only link to the mysterious disappearances of a few members of the community. Sam not only has to deal with the accusations, but the pack themselves. Cole, is searching for a cure. But it soon becomes apparent that he might not have enough time to find it, especially when a hunt to kill all the wolves is approved. At the same time, we get a little more involved with Isabel and Cole and a relationship that may or may not ever happen. Forever, is filled with twists and turns and lots of suspense. It's a serious page turner, and not as predictable as I thought it would be. In fact, I absolutely loved the ending! I won't say much on that, except for this is one trilogy that I finished the last page and didn't wish I could re-write a bunch of it to give it a conclusion. Forever, left me satisfied and in love with the entire series! All I could say when I finished, was that it was so great I can't believe it took me so long to finally read! 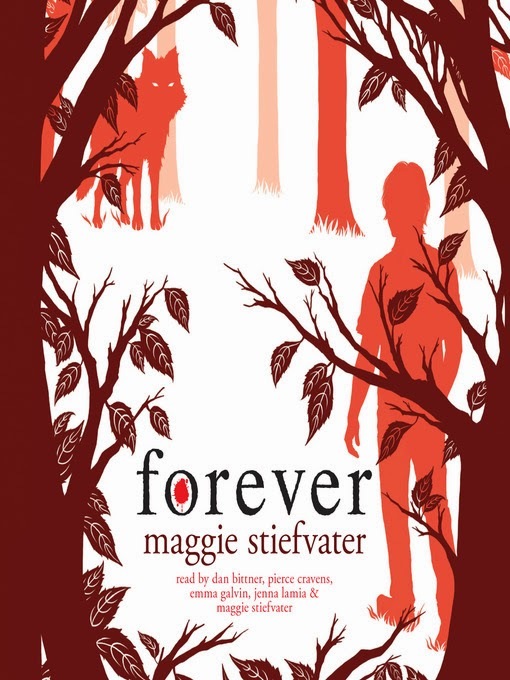 I highly recommend this series by Maggie Stiefvater, to anyone 15 and older. The trilogy is fairly clean and a fast read. The entire series is out in print, so you can just read book after book and not have to wonder and wait to see what happens. This is one of those unique series that gives you a different spin on things, and lets you sit back, enjoy and escape reality for a little while. You won't be disappointed picking this series up! I absolutely LOVED the first book (Shiver) ... I liked the 2nd and 3rd fine, but I almost wished I'd stopped at book one as it had such a "moment" at the end that I didn't quite feel again in the series. The first book was great! But oddly, I loved the 3rd book the best. But I know what you mean about having that "moment" in a book series and not feeling like the rest of the series lived up to it. I've had that happen a few times with other series too! That's awesome you incorporate both exercise and reading!! !